Second Picture is devoted to original tutorials about 3D graphics, Photoshop, Photography and Web Design. Depth of field is a characteristic of a camera that can be used to enhance the image composition of the photo. Depth of field means the sharp area surrounding the point of focus. The magnitude of the sharp area is affected by several factors: distance between the camera and the subject, focal length and aperture. The closer the subject to the camera, the more shallow the depth of field. The longer the focal length, the more shallow the depth of field. The larger the aperture (smaller the F-number), the more shallow the depth of field. It is important to understand how to affect the depth of field in order to utilize it in image composition. For example, the subject of the photo can be emphasized by isolating it from its surroundings by using a shallow depth of field. Shallow depth of field is usually used in portraits and large depth of field is usually used in landscape photos. Picture 1. The subject can be isolated from its background by using shallow dept of field. The dragonfly in picture 1 has been isolated from its chaotic surroundings by using shallow depth of field. 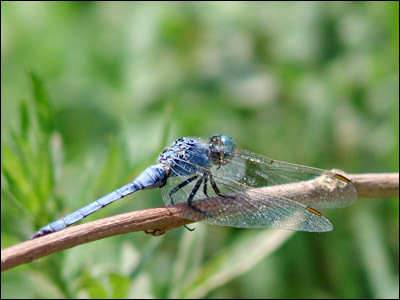 By using shallow depth of field the distracting background is blurred and only the dragonfly appears sharp. Viewers eyes concentrate first on the sharp areas of the photo and so the dragonfly gets all the attention. Picture 2. 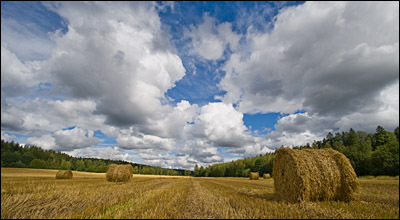 It's usually a good idea to use great depth of field in landscape photos so that all areas of the photo appear sharp. Usually it is good for landscape photos if all parts of the image appear sharp. There is usually no need to isolate elements by utilizing the depth of field in the landscape photos. All around sharp photo can be achieved by using large depth of field. In order to get large depth of field you should use rather small aperture. This also means that you must decrease the shutter speed. Therefore it's often necessary to use tripod when taking landscape photos.